peterme.com – Page 2 – Thoughts and essays from the guy who coined the word "blog." 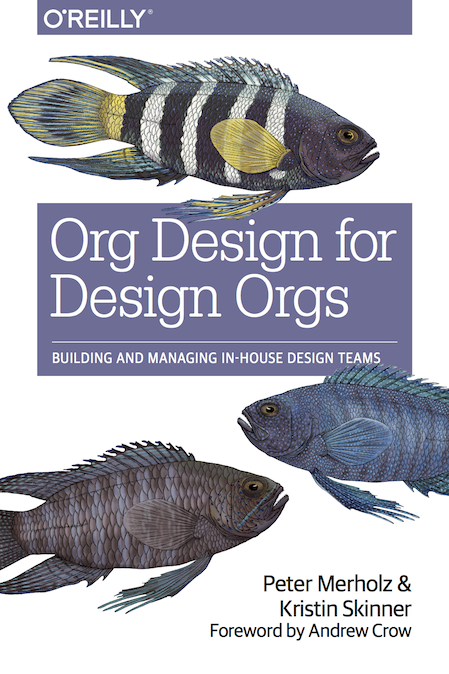 I’m co-writing a book on building in-house design teams. I’m also currently in the job market, so I’ve been thinking about, and talking about, the role of “Head of Design,” which you’re starting to see pop up across Silicon Valley. Here’s what I wrote to define the role. For design to realize its potential requires focused, empowered leadership. “Head of Design” has emerged as a title for this role, which works regardless of whether they are considered a manager, director, or VP. A Head of Design provides a creative vision not just for the design team but the whole organization. They establish processes and practices for realizing that vision, and set the bar for quality. They contribute to the development of brand definition and experience principles, and ensure that those are appropriately interpreted through the team’s work. Their managerial leadership is realized through the tone they set for their team. What kind of work environment do they foster? How are team members treated, and what opportunities are they given to grow? How is feedback given? How do they hire, and who does that bring in? The sum of these decisions defines the Head of Design’s managerial style. Operational leadership is a combination of very little things and very big things, all in the interest of optimizing the design organization’s effectiveness. The little things are what the rest of the team sees, in terms of how communications are handled, which tools are supported, how work is scheduled, how team meetings are run. The big things tend to happen behind the scenes, and involve interactions with a company’s core operations teams such as finance, HR, IT, and facilities. These include opening requisitions for headcount, adjusting salaries to ensure market competitiveness, establishing employee growth paths, acquiring the necessary hardware and software, and claiming physical spaces. A common mistake made by company leaders when hiring a Head of Design is to favor creative leadership qualities over the managerial and operational. They bring in a creative visionary with big ideas and a beautiful portfolio, but often those folks don’t have the patience or mindset for the mechanics needed to actually make an organization run. Team members struggle without good management, flail without tight operations, and the team proves far less effective than they could be. Admittedly, it’s a challenge to find an individual skilled in all three forms of leadership. Remember, this role is the “CEO” of the design team, and as such, managerial and operational excellence are crucial. Recruiting and hiring. Always. There may be nothing more important in the organization than identifying talent and getting them to join the team. Living the culture. Addressed in depth in Chapter 7, the culture of a design team is essential to its long-term success. A Head of Design not only establishes the team’s cultural values, but demonstrates them every day through their actions. Process and practices. Working with design managers and creative directors, establish a methodological toolkit, and make sure it is shared, understood, and used throughout the team. Vision. Developing a “north star” for the company is not a one-time act, but an ongoing process of refinement and evolution. Represent design for the organization. The Head is the primary voice of design inside and outside the company, sharing its work, evangelizing its success, articulating its vision. And sometimes this representation means fighting for design in the face of policies, procedures, and bureaucracy that limits the team’s potential. …is Adaptive Path’s MX Conference, taking place on March 29-30 2016 in San Francisco. I’m biased. After a few years away, I’m back and helping program and host this year’s event. We have a stellar line-up, including Bob Baxley (formerly Apple and Pinterest), Hyo Yeon (leading the design charge at McKinsey), Janaki Kumar (VP Design at SAP), Kim Scott (spreading the gospel of Radical Candor, a philosophy I can totally get behind), and many others. Oh, and me (I’ll be co-teaching, with Kristin Skinner, a workshop on “Org Design for Design Orgs”, based on what we’ve been writing in our book). No other conference packs so much value into two days for folks who are managing/directing/leading design teams. AND: Use the promotional code FOPM to get 15% off the registration price! Historically, most formal design has been practiced by design agencies, which were environments set up to deliver optimal design output. As design increasingly moves in-house, into environments that are not only not optimized for good design practice, but can prove quite hostile to it, a measure of a design team, and its leadership, is how they navigate this. Many design teams find themselves at one of two poles. I’ve now seen a number of teams, whose leadership comes from the design agency world, try to protect design by insulating the team from the rest of the organization. Essentially, these teams try to re-create the studio model when moving in-house, but in doing so inhibit connection with the rest of the company. This may lead to great design work in the abstract, but it also ultimately leads to ineffectiveness, as without those connections, the work of the design team is not realized through the product. The other pole is one of total integration. Product design molds itself to whatever product development process exists, usually some flavor of agile. While this integration allows design to have some effect, the quality is subpar, because design is a different kind of activity than engineering, and what works for technical development is not ideal for great design. So, by trying to be accommodating team players, design loses what makes it interesting in the first place. The challenge for in-house teams is to figure out how to keep that creative spark that makes design such a valuable contributor, without isolating it so much that it’s simply out of sync with the rest of the organization. It’s one of the (many) reasons I advocate for what I call the Centralized Partnership–centralization allows design to maintain it’s mindset and community of practice (i.e., it allows design to remain a little weird), while the partnership ensures those connections with the rest of the organization that keeps design relevant. To maintain this balance requires vigilance and continual adjustment. This is a key aspect of any design leader’s role, ensuring that design doesn’t get run over by development processes, and not being so precious that it’s never put in a position to be realized.